Zhao Gang b.1961 is an artist. 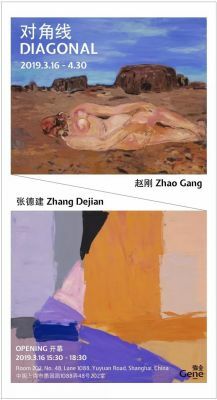 Gene Gallery is glad to announce that the exhibition Diagonal will be held from March 16th to April 30th, presenting the works of two artists Zhao Gang and Zhang Dejian. Different personalities and life experiences impelled both of Zhao and Zhang to look for inspirations as well as draw knowledge from social changes and the history of China. Their works are like the two ends of a diagonal, showing contradictions as well as harmony in their own corner of the world. By chance, both of them like to name their artworks ‘untitled’. Zhao Gang once remarked that his re-try of traditional paintings was an attempt to reconstruct radical parts of Chinese art, trying to understand the consideration of ancient artists according to their groundbreaking landscapes. As for Zhang Dejian, he emphasizes the importance of ‘order’. He uses art as an approach to explore the intrinsic rules of the physical world and to get closer to his inner truth. Through decades in the development of Chinese contemporary art, ‘the west’ has always been regarded as the reference. Implicit or explicit, its influences are never faded all the way through the historic revolutions and social developments of China. Inevitably, when facing the dilemma of endless choice-making processes in an ever-changing era, artists seem to be in the paradox of being inside or outside of mundane life. With the influx of western thoughts and art styles, some artists step out of the previous simple rebellion of art patterns, re-examining and re-positioning their artworks under a global perspective. This kind of reflection once started, keeps running through their creative life. ‘Identity’ is what both Zhao Gang and Zhang Dejian have always been tracing. They escape, return, and stand still in their own life journey, rebuilding a part of their spiritual world through the language of the image.